Now do #1-11 for a second and third round. Part 2: Cardio - Do each exercise for 20 sec effort, 10 sec rest interval twice than move onto next exercise. Perform 1-2 rounds of circuit below for a good cardio & fat burn after toning those bootays! Combine all ingredients and make into patties. Put 1 -2 TBSP Sunflower oil in pan over medium-high heat. Don't let oil get so hot it smokes. Pat a little bit of coconut flour (or any flour you want or have) on your cauliflower cakes (to help them brown). Throw cauliflower cakes in pan when pan is hot. Cook until browned on both sides. 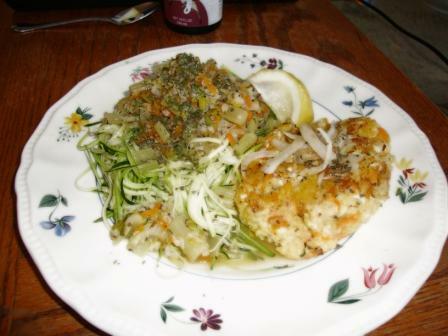 I served up my cauliflower-carrot patty next to a side of my zucchini pasta! So good!